Where sold only on the basis of improving indoor mobile phone reception, femtocells have to compete with several alternatives. Dual mode WiFi and Signal Boosters are two specific alternatives they must overcome. The nationwide launch of Sprint’s Airave femtocell in August 2008 has heralded mostly positive reviews – excellent signal strength, great voice quality, easy installation. Their target market is customers with poor indoor coverage, rather than data or connected home use. Indeed, the product is very much a 2G system, not supporting high speed data, and the tariff plans give no discount for SMS or data use. But it directly competes with solutions for poor coverage including active signal boosters and Dual-Mode WiFi/cellular phones. Which of these solutions are available, and what are the tradeoffs? 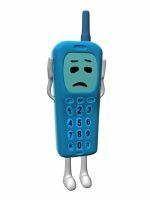 What causes poor cellphone coverage? Poor coverage can be down to the specific phone model, as was initially reported with the 3G iPhone launched in August 2008 (and later addressed by a firmware update pushed automatically to all devices). More commonly it's due to distance from the cell tower, geographic features (hills, mountains, buildings) in the way and/or being behind walls or basements which reduce signal levels. Use call forwarding to redirect calls to your landline phone Straightforward to setup from your phone Unless activated manually each time you return home, this could cause calls to be picked up by other members of the family or ring before diverting to voicemail. Unanswered calls may not divert to mobile voicemail. Call charges may apply, or be included in bundled minutes. You can then answer either one. If travelling, you can use your VoIP service to receive calls avoiding roaming charges. More complex to setup, requires a new/different phone number, more potential for errors VoIP subscription and call charges. Use a wired indoor antenna. A docking station or wired connection is required to connect to the phone, which then amplifies the signal through an external antenna Works with any phone, any operator. Mobile phone cannot be used as cordless device, wandering about the house, but is very much tethered to a fixed location. Call handover when entering or leaving the building won’t work. Requires mains power Cost between $40 and $100. Use a dual-mode WiFi/Cellular service such as HotSpot@Home from T-Mobile Works with any WiFi including when travelling to hotels, public areas etc. Requires specific WiFi/cellular phone, supporting mobile operator, broadband connection Cost of WiFi/Cellphone (Free with some plans) + hotspot ($30). Plans including unlimited hotspot calls from $30/month. Use a femtocell, when they become commercially available. Self installing. Works with any standard 3G phone. Requires a broadband connection $99 + $4.99/month (Sprint, USA). Let’s explore wireless signal boosters further. These are not legally permitted in many countries and are not cheap compared to femtocells today - $300 rather than $99 for Sprint’s Airave. Take the YX510 as an example (the reviews on Amazon are worth reading too). The flipside is how it affects the mobile operator network and other users. Signal boosters operate by re-broadcasting the signal from your phone in the same way as a megaphone amplifies your voice. This can seriously impact the operators carefully tuned radio plan. Now imagine if you are in a remote farmhouse miles from the nearest cellphone tower. Using a booster is like standing on top of the house shouting with a megaphone. These boosters work both ways (transmit and receive) so you should also be able to pickup weak signals and improve reception – those calling you will sound clearer. From the mobile phone operator’s perspective, you now appear as a much stronger signal, but which can be controlled in the normal way. Signal transmit power levels can be remotely controlled by the nearby cellsite to the minimum level which reduces interference with other users. A few stray boosters used in this way probably don’t impact the overall radio performance in a sparsely populated area. In more densely populated areas, the analogy of giving everyone a megaphone becomes more appropriate. Those using or requiring such signal boosters are probably located in obscure and difficult to reach coverage areas. By radically increasing their transmission power without considering the nearby radio environment, these can wreak havoc within the carefully planned radio transmission plan, significantly affecting the performance and user experience of all nearby mobile phones. Calls may be dropped; phones may need to transmit with higher signal power thus reducing overall cell capacity and range. For these reasons, signal boosters are outlawed in many countries. Where allowed, they do compete directly with the simple poor coverage business case. Femtocells will therefore have to sell at a lower price, be easier to install and entice customers with other benefits. If mobile user is a good customer and heavy use customer at the same time. E.g. The number have active for many years without terminate or suspend, the user pay the bill on time, the customer invite their friend to use his network. Femtocell should be given as complimentary for the royalty customer without any term because femtocell help a lot for them to improve their coverage and make them more impress. Well most bar would mean that you have a good coverage to talk .. but what about the data transfer. Everyday the services provided over the phone is increasing, soon it will amount to such a huge data rate that it won't be possible to serve most of the phones .. then comes the femto cell. But then again as its emphasized that femoto cell implementation will depend on the vendor provider, how is it different from any wireless phone installed at home. It sounded the same then for accessing the advanced services you are again confined in your premises. If not then we must be assessing others femto to achieve the same result. Why would I pay for the femto cell device when it is freely available for the other person using the same vendor. Another issue that come to mind is what if multiple vendor at a given place of high importance provides the femto service. What will prevent them from using the same frequency that will result in alot of disturbance in data transfer due to excessive collision. @Ohmn: I'd say its likely operators will provide femtocells as part of a package, which effectively means they are free for higher spending customers. They need to compete with Dual Modw WiFi offers (HotSpot@Home etc.) and offset the idea that operators should be providing good inhouse coverage anyway. @Jesse: In some cases, Signal Boosters do meet the needs of customers. It's good you've found a solution. But not everybody is capable of even running a wire to an external antenna. The larger concern is that if everyone did this (especially in dense urban areas), it would compromise operation of the wireless network overall - its a bit like everyone talking with a megaphone - works for one or two people in an area, but not for everyone. @V1D1t: Femtocells will provide excellent data speeds as well as voice quality, due to the very short range and therefore high radio signal quality. This will be even more true for the next 4G radio systems called LTE due to rollout from 2010. So although everyone can use mobile broadband data, it will work faster/better through a femtocell. Each operator has been allocated different frequency spectrum, so there is no interference between customers on different networks in the same area - whether these are femtocells or not.